I spent a good portion of yesterday researching chickens. I’m fascinated by the idea of keeping chickens in the backyard for eggs! 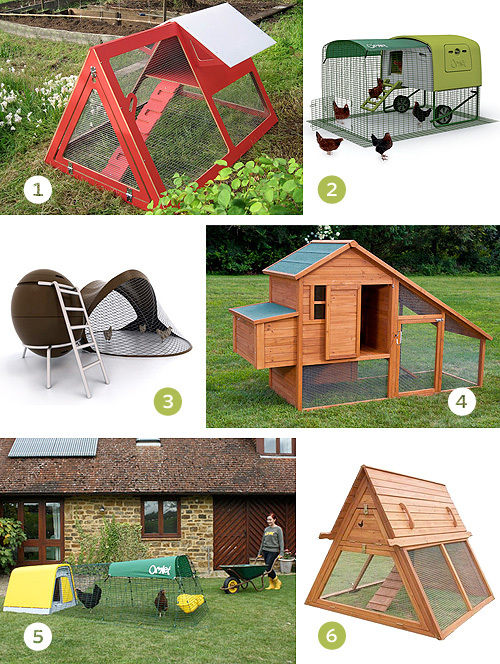 I don’t know if it’s right for us, but I had a lot of fun looking at chicken coops and imagining having one out back. Design*Sponge recently wrote about keeping chickens, and Apartment Therapy wrote about the subject a couple of years ago. As people are becoming more aware of their food sources and sustainable living (both things I’m working on), it seems chicken keeping is making a big comeback. I haven’t met anyone keeping them in an urban (or suburban) setting, though it seems they’re out there! Do you or any of your neighbors have chickens? when i was in high school and college my parents had one. we live in a suburb (still a city of over 100k) in the san francisco bay area. I have checked into it, but my town *technically* doesn’t allow it, but I too enjoy reading about others who keep chickens in their urban setting. I live in Berwyn and I swear that one of our neighbors has a chicken or two. Once in a while I’ll hear something that closely resembles a roster or chicken. Before you get any further in your research, check with the city (village?) of Oak Park. If you have a garage, I bet you can house your chickens there for the winter months. we do! get them, you won’t regret it! they’re so fun and sweet and our kids (even the 1yo) love them and are good to them. get the book “hobby farms chickens” by sue weaver and get three chicks. everyone we know gets all the same breed, but we don’t have two of the same! for us, they’re pets and egg sources, so we had fun picking out different kinds. they will be meat some day, and our kids have been well-reminded, but we haven’t slaughtered any yet. anyway, they’re just delightful and such a fun addition to our family and life! I want to have chickens sometime in the future, too. A couple of my mom’s friends have chickens, and we regularly get eggs from them. They’re pretty big, and you can totally tell if something was made with the “happy” eggs cause it’s a much brighter yellow. Happy eggs taste better, too. Oh, and how cool is the Eglu Cube!? I have chickens! I think it’s so funny how they are becoming hip all of a sudden. We got ours about two months ago and I absolutely love having them. They are great little pets. They will follow me around the yard and jump on my lap when I sit down. I highly recommend getting some! If you choose a good, hardy breed (Buff Orpingtons were our favorites) and have a place where you can keep the coop over winter with access to electricity for a heat lamp, I say go for it. We never lost any to weather, even in northern Colorado during back-to-back blizzards. I have chicks as well. I ordered them last October as one day old chicks from mypetchicken.com. I live in south Minneapolis and had to get signed approval from nearly a 3 block radius, get that notarized, let the city know how many chicks I planned on keeping and send in a $34 check. We built our own coop and had the city inspect it. Once it passed they sent the chicken permit that has to be renewed once a year. If I ever want to add more chickens I have to go through the whole process again. I ordered full grown silver laced wyandottes. The minimum order was 3 but they sent 4 incase one dies in transit. They all lived and grew for a few months in a little pen in my basement until it was warm enough and they had enough feathers to transfer outside. They made it through a very cold MN winter in our coop (which has natural gaps to release air – very important in the summer) with two heat lamps and a heated water bowl. Note that the heated water bowl and lamps doubled my electricity bill for the winter months. I’m looking into solar now. My petchicken guaranteed that I would not receive a rooster but as they grew we discovered that our favorite, Eleanor, was in fact a rooster when she started to crow and we were woken by the neighbors. Roosters are not allowed for obvious reasons. She made a quick trip to my parent’s farm where she happily lives. My chicks, Prudence, Martha and Penny are 6 months old and 2 of them have begun to lay eggs. I have two eggs a day. They are pretty small right now but should get bigger – they are delicious! I have a home made chicken feed recipe for the winter that will hopefully help continue to lay eggs through the colder months. I found most of the info i needed to know on mypetchicken.com. Everything else was supplemented with questions to my mom, reading backyard homestead and googling. I had someone give me an estimate on chicken coop building which was very expensive and i dreamed of many beautiful coops as well but eventually just built our own which was really fun and affordable. The chicken poop is great for the garden once its composted for a few months! Dottie Angel talks about her chickens on her blog today and shows some fun pictures of them. What a great coop roundup! My style is a little more vintage, so I thought I would share this amazing coop built here in Portland OR of reclaimed wood. Its definitely on my wish list for when we get chickens! I’m trying to convince my husband that we should get chickens. Been trying for almost a year since we moved out to the country. We have a great greenhouse that isn’t being used that would work well for a chicken coop. I only want two or three. Just enough to enjoy some good eggs. Plus, it would be so much fun with our daughter! My sister-in-law is looking into this, but she (along with my husband’s family, obviously) grew up on a 700 acre cattle ranch…so she has experience with them. I don’t…but I recently read this article and it scared me, ha! Just a thought about the possible downsides, but I would love to have my own fresh eggs! Good luck! All I can say about that article is that there are of course, many different breeds of chicken and some are far more aggressive/high maintenance than others. We have three New Hampshire Red hens and they require far less maintenance and care than our dog. They are calm, docile, endlessly entertaining pets that come when called and meet our kids at the school bus. We love our chickens! Thanks for linking to my somewhat tongue-in-cheek article about urban chickenry. While I’m sure that a lot of people have perfectly lovely experiences with their back yard chicken coops, we had them when I was a kid and it was anything but lovely. There’s a side to all of this that never makes it into the glowing articles about raising your own chickens. That side being that it’s a commitment that has to be undertaken seriously. Chickens are a mess, they make lousy housepets and a lot of breeds can be aggressive. It’s easy to see the magazine spreads and be carried away with the idea that you’re going to have a half-acre paradise and save the earth while you’re at it. But that’s a mistake. Taking on a flock of chickens requires a lot of thought and planning. If you want to take a crack at it, go for it. Just not in my neighborhood please! You may now flame me. OK, the photo of the chicken feet is scaring me a little. I’m a teensy bit afraid of birds… BECAUSE of their hideous dinosaur feet. I “chicken sit” for my neighbors. Be forewarned that they poop everywhere, in all directions, and it’s like diarrhea. Therefore, it’s best to have a moveable, floor-less coop, like the ones you pictured. Otherwise you’ll be scrubbing poop from the flooring on a regular basis. But think ahead to winter, when you’ll likely need to put them in a more permanent location (with heat lamp). You WILL be scraping poop — can you handle it? Also, if you let them free in your yard (which you really should do daily), you’ll need fencing to keep them out of your flowerbeds and other planting areas. They are born to scratch, and they are very destructive and non-selective with their scratching! They can obliterate a large flowerbed in less than an hour. Get at least 2 but no more than 3 for an urban garden. One chicken would be lonely — they need companionship or they’ll be too depressed to lay! My advice is for you to find someone who has chickens and see firsthand what is involved. Blogs, articles, and tv spots make it look so wholesome and easy, but there is work with chickens. Those eggs aren’t free! I live in a suburb of Salt Lake City and my sister keeps chickens here and so do several of my neighbors. I’ve only heard good things about keeping chickens, especially how fun it is for children! I agree with Robin, you probably wouldn’t want to start with more than 2-3. My kids have been begging for chickens lately. My girls are in love with the Saltbox coop. How fun! In theory, I like the idea of keeping chickens.. in practice, it annoys your neighbors. I know because my neighbor keeps them and they make noise all day – they’re not even directly beside my home, they’re 1 door down – and I can hear their chickens all day. When I try and sit in my backyard for a quiet moment, I can’t–chicken noise! Sorry to be a downer, but I’m just trying to offer another perspective. I really wish my town had an ordinance against keeping chickens in a suburban area. Agnes, I’m in the city, and there are constant noises outside. If it’s not a dog barking, its a lawn mower or come other power tool. It’s not like we can go outlawing everything that makes a noise, can we? I’m not a city dweller though — I live in the suburbs. People move here to get away from the noise. If I wanted to hear a rooster crowing at dawn, I’d move to the country. You wanna know what’s really annoying? Having no central air and having to open your windows on a hot summer night.. and then being woken up at 4 am. If my dogs were out at 4 am barking endlessly I would get in trouble.. so why should there be a chicken exemption? My parents live in the country sorta (40 acres) and have had chickens my entire life. We LOVE them! I live in town (Council Bluffs population is around 75,000) and one of my neighbors has chickens, I am planning on getting a permit as well and having 3-4 in my backyard near my garden. Such a fun thing to do. I think you would love it! We had chickens when I was a kid and they can be really mean sometimes! I have a scar on my knee from one of the roosters attacking me! Other then that they were pretty cool. The eggs were great. I do kind of hate birds flying near me now though.. They really can be quite mean! I grew up on a farm and we had lots and lots of chickens and, like you Michelle, I suffered an attack from a mean old rooster. The hens weren’t much better, but the eggs were delicious! if you have a mean rooster, it goes in the pot. I’ve done a ton of research on chickens too because we’ve thought about getting some. They do live a long time, up to 15 years I understand, so it’s like committing to any pet. They always need fresh water and you’ve got to rake the coop at least once a week. And they don’t smell pretty. But think of the fertilizer you’ll have ! Our town allows them in suburban areas, but we’ve got a lot of poultry around here. Just thought I’d share this link with you, the ultimate chicken coop. It rocks my socks. Gotta say though, there is NOTHING like fresh farm eggs ! They taste amazing ! mr. flapper is also on facebook and has a webcam on Ustream as well to watch her sancutary. Double check the city you live in if there is an ordiance in place that will allow you to have chickens. I know where I live they just now allowed people to have two hens and no roosters. Oak Park also allows two hens and no roosters. I know this is popular right now but none of those look like they’d provide a humane amount of space for chickens to roam. I priced everything out, and it was far easier and cheaper to build my own. Many of the ones for sale out there give the birds very little space, but then again, it depends upon how many you have. We’re allowed 2 hens per household in my town (no roosters allowed in city limits), but my backyard is big enough to qualify us to have an “unlimited” number. We have 13. My coworkers bring vegetables and bread in for me to give to them, and I supplement that with sprouted local grain. Feel free to email me any questions! i would LOVE to keep chickens, but my boyfriend is vegan and i just don’t think i could go through the eggs fast enough by myself. a friend of mine lives in berwyn and looked into it, but discovered it wasn’t allowed there. i know it’s allowed in chicago limits, though. those coops are so cute – do they make chicken coop heaters to keep them warm? It ok if you cant eat all of them. You just sell them to your friends that dont have chickens. I have chickens. Three to be exact. And our coop is actually the “portable chicken coop” from your list. (We love it.) We live in a suburban town on about 2 acres. They are pretty low maintenance and supply us with three eggs most everyday. And those three eggs add up FAST. We usually give our extras away to friends and family. But, we could most certainly sell them if we wanted. Every afternoon we let them out of their coop to get some exercise and peck around. (Side note: somebody already mentioned this. A fence is a must. They gobble up all things pretty in search for food.) At sunset they make their way back into their roost, so all we have to do is pull up the ladder to keep them safe. Another plus is that chicken feed is cheap. I just bought a 50 lb. bag for $11 yesterday. As for noise, the only time I ever really hear them is when they get fidgety in the morning before I let their ladder down. Oh, and the poop. Yes, they poop everywhere, but that poop is solid gold in the fertilization world. So, I suppose there is a possible up side to everything. I’ve never seen a chicken coop so cool! Chickens are so messy though. As stated before, they will wreck your garden, smell and be noisy. If you are prepared to put up with that they are lovely pets, they have real character and do produce wonderful eggs. The only real way to stop them ruining your garden is to keep them cooped up and as mymsie said, they really don’t have enough room in those coops. Saying that the Omlet is really easy to clean! we had chickens for a while when i was growing up, but then found out the city didn’t approve and gave them to friends with more land in a rural city. I live in Boulder, CO and I know about 20 people that have chickens. My plan was to let my friend do it and then see how it went. She is thrilled with her chickens, but after we were at their house, the bottoms of all our shoes (and my son’s feet since he took his shoes off) were covered in chicken poop and it was very sticky and yucky. (I really had to scrub it get it off my son’s feet.) She also said she had to put vaseline on their beak’s or their waddles or something, and I realized I just don’t have it in me to take care of chickens. But to the person that said the rooster noise was annoying – our city doesn’t allow roosters, only chickens. I think roosters are the problem when it comes to noise, but I could be wrong. I totally have been thinking the same thing… A book that deals with the topic of eating locally in a really interesting way is ‘Animal, Vegetable, Miracle” by Barbara Kingsolver (& her husband & daughter). It follows her family’s year of eating locally (mainly from their own roost of chickens, turkeys, and garden) and is a fascinating look at how it can truly be done… really made me think about where our food comes from and was a really interesting & inspiring read that I think you’d enjoy! You can keep up to two chickens in Oak Park. One of the Longfellow Elementary teachers has two in her OP backyard. I grew up on a farm with chickens (both in a permanent coop and roaming for fertilization and sanitation of fields) and I think they’re very romanticized. I know some people rave about them, and perhaps 2-3 as pets would be manageable, but in a commercial setting I found them to be a lot of work, smelly, messy, noisy, stupid, and mean. I suppose I’d be angry too if someone was stealing my babies (a.k.a. eggs) every day, but they were vicious and used to peck the crap out of my legs, hands, and anything else they could reach. I generally love animals and get along well with them, but I’d personally think long and hard before deciding to raise chickens again. we get ours as hatchlings and handle them alot. once they go out to the coop they stay very friendly and will follow us around the yard and come to us when we call. I love in the city of Atlanta & several of my neighbors have chickens. They live in the Reynolds Town & Cabbage Town areas. It is funny to be walking my dog & see some chickens cross your path in the middle of the street. I live in south philly and there’s chickens running loose all over the backyards on some blocks. my last place all the yards had been taken over by 20+ loose chickens. you hear the roosters all day. I don’t think I know any one that keeps them for food or anything…a few people have them as a pet in their house though. We kept chickens for awhile in a (fairly large) suburb. We ended up giving them up to someone with a proper barn come one winter though, it was just too hard to try and keep them warm enough. We just got our chickens this weekend! My husband build a chicken trailer similar to #1 and we now have 4 chickens living in it and producing eggs. We also attached wheels to the bottom of our trailer so it is easily wheeled around the yard. We keep them for the summer for eggs and enjoy the meat in the winter. My daughter (2 yrs.) LOVES them! This is the second year we have had a few chickens. Our neighbors have chickens, and we live in a suburb of St. Paul, MN. We moved in after they got them, so I’m not sure if they had to have the neighbors agree or not. But, they do have them outside in the winter and they survive! Pretty impressive as I wine just walking out to get the mail on a cold day! I only wish it was more mobile and a bit off the ground. Our hens are very happy and so much fun. This is great! I would LOVE to have chickens, but the city I live in doesn’t allow it :( Hopefully someday my husband & I will move further into the country and then I’ll have to remember this post! Very cute & fun modern chicken coops! My metro area (Nashville) doesn’t allow us to keep any livestock including chickens. I’m not sure if I’d be up to the work anyway – a vegetable garden is as close to urban farming as we’ll probably ever get. We have been researching bee keeping, though! we went to tractor supply co. on saturday just to oogle the chicks and ducklings. it was so, so hard to not bring one home! i’ve wanted chickens for a couple of years, but my hubby grew up with them, so that, along with the fact that we buy AMAZING eggs from our csa farm, makes him less-than-thrilled with the idea. I’m in Seattle and at least 1/3 of my neighbors have them. Chickens are everywhere here! They love them not only for the eggs but also for the gardening benefits – they naturally “fertilize” and take care of bug problems! You don’t think so? There are so many kids on our block… I think they would love to come over and see chickens! Oak Park is such a crunchy/granola/liberal kinda town (and I mean that in the best way possible), I think there are already a lot of people keeping chickens here. It’s illegal in my city to keep “farm animals” within city limits. I think there are pros and cons. Personally, I’d rather buy my eggs from a local farm and support their business. My best friend in highschool had chickens in her back yard. Smack dab in the middle of a big campus and it was never a problem. I just joined a Facebook group trying to legalize backyard chicken coops in OKC city limits and know of a couple people with them in their yards. It’s definitely making a comeback. I LOVE all the coops you found. I can’t wait to show my husband. I have wanted chickens since reading the book “Keep Chickens! Tending Small Flocks in Cities, Suburbs, and Other Small Spaces” by Barbara Kilarski. GREAT READ – see if your library has it. My brother keeps chickens in his large suburban yard (where he is growing organic hops and the chickens keep the grasshoppers under control!) Check out his (expired) eBay listing, which describes the breed he has and why he chose them (he’s in Minnesota, so it’s cold like Chicago, and his grandson is 2). Since you have Eleanor it might be a good breed to explore. http://cgi.ebay.com/ws/eBayISAPI.dll?ViewItem&item=310208650661 Friends in St. Louis keep a couple of hens in their back yard and love them. Let us know what you do! I love the coops!! OMG! I want chickens so bad, and now seeing those coops, I really, really want them!! there needs to be a distinction made between “i grew up on a farm” and keeping a handful of chickens in your backyard. chickens are gross, for sure. they are messy and a lot of work. but two or three? easy peasy! and such a small flock allows the attention to ensure they’re more pet-like than cafo terrors. my dad and husband both grew up on farms with huge henhouses (100+ hens) and HATE chickens, as a rule. our half dozen? they both love them and draw no parallels between them and their previous poultry experiences. A friend of mine in Portland, OR built an amazing coop he refers to as the “Chicken Sedan”. One of the ingenious features is that is is portable, and meant to be rotated over several planting beds to fertilize the soil. Have you seen this adorable custom built chicken coop? It pretty much made me think I needed 4 pet chickens named Mabel, Daisy Mae, Mary and Annabelle for a good 72 hours. So cure. We had chickens out in the country (and loved the fresh eggs and natural bug/weed killer) but we moved into town 4.5 yrs ago. We are currently looking into getting 4-5 hens (prob East Egg hens because their eggs were always so pretty). I would bet money you can make a better coop/run yourself! Would LOVE to see that! I have 4 chickens and am a bonified city girl. Manicure, high heels, the works. I love my girlies and the eggs are glorious. Feel free to contact me anytime and I can tell you more! Love your blog! buk buk! I live in a semi-urban area and my dear neighbors keep chickens. It’s fantastic to have fresh eggs. Also, the chickens are like amped-up composting machines. My neighbor gives them all kinds of table scraps and the chickens in turn make the most wonderful soil for the garden. What an excellent idea! I saw some beautiful chicks at the Farm & Fleet a few weeks ago and pondered this idea myself! And I live in the city! Honey, I thought was a great idea, too, when we bought our first home. Our baby chicks produced 3 hens and 1 rooster. 1 of the hens got grabbed by a hawk. The rooster grew up to be gorgeous but aggressive. He also was a bit too amorous with the smaller girl, so we had to arrange separate areas for the girls and the boy. They laid eggs for about a year and a half (and yes they were yummy, but too few overall.) The habitat options you show are laughable. We believe in giving our animals a reasonable habitat. The coop my husband built was dubbed “the Poulet Palais”–cut redwood casa tucked beneath a tree for summer shade; a trio of nesting boxes with their own lockable doors; a front entry way and ramp; clerestory windows to let in the light; a tiled floor for easy cleaning; a shingled roof to match the main house decor. 5 years later, we are down to one hen and of course our rooster. We’re constantly vigilant against neighborhood racoons and the hawks. The rooster is still a sight to behold, but we need to approach him with caution. The hen hasn’t laid an egg in 3 years and wants nothing to do with either us or her amorous mate. Overall, the project fell way short of our expectations. so much for my farm fantasy but good luck to you! Be sure and check your local ordinances. It may be illegal, particularly since you live in a very urban environment. I don’t know for sure, but I suspect it would be a lot more work than it seems. Keep us posted on your decision! I live in Southern California and have not seen any neighbors with chicken coups, but my husband and I lived in Portland, Oregon for 3 years and most of our friends kept chickens in their backyard. We are moving up there in a year and I’m already planning my chicken coup :) Good luck with yours. we have six chickens in our backyards in a suburban area. the coup isn’t anything fancy though and one chicken has learned how to escape. our neighbors don’t mind, but they’ve said they love watching my sister & brother in law run around the yard chasing them back in the coup. before it started getting warmer and the chickens weren’t producing a lot, we’d supplement with store bought eggs. it was so strange to see scrabbled eggs from the store next to scrabbled eggs from our chickens on the same plate. our eggs are tastier (in my opinion) and brighter yellow. One of my co-workers owns chickens … however, I work at a school that is in a farming community on the outskirts of the city … lol, so I guess its not really the same thing! We have four chickens (but we do live on a farm and have horses for riding, cows for milking, lambs for eating etc) and I love them, they’re such funny little creatures. You could def have them in backyard, my brother in law lives in a tiny terrace in Melbourne with no yard and has bantams in his back alley! Chickens are great! BUT they actually need LOTS LOTS LOTS of space to be happy and semi-self reliant. Also, the yard space that you keep them in will get ruined. They need shelter, water, food (usually dry pellets and lots of leafy greens) plus bugs/worms etc, nesting boxes, wings clipped, protection from cats, rats and other nasties, and usually you’ll need bantam hens if you want to raise chicks. I’m sure you know this – but don’t get a rooster. I don’t even think you’re allowed them in most urban areas. Chickens also take a while to stay laying eggs, and won’t do this all year round. They are fantastic – we have them in the backyard (in a big city in NZ) but!!! they honestly do need a lot more space than the likes of the coops you’ve shown here. Holy crap your timing is eery. I just mailed a deposit check to a local builder for our first coop today(custombuiltshelters.com)! We live in Carmichael, CA. Our neighbors have a few layers. Can’t wait!!! My mom had chickens for a few years before she retired to Mexico last year, I really loved the fresh eggs from them. Reading the comments about them needing more space then the ones you show is going to send me off to do more research, I really like some of those options and some of them look secure enough to protect against the giant raccoon population we have here. Our neighbors (in Seattle proper) have 3 chickens that roam the neighborhood during the day and return to their protected coop at night. There have been 3 of them for a couple years and no mis-haps so far – the kids get a kick out of seeing them scratching around in the school yard. I lived on a farm for a few years in Michigan but I don’t think chickens are appropriate for urban settings. They require a lot of work and the homes are too close together for the noise and smell. The neighbors would not appreciate the sound of the clucking at 4 in the morning. I would be curious if Oak Park allows chickens though. I would love to get a llama personally. They make great watch pets. Bah! I want chickens so bad it hurts but my husband won’t let me do it! My neighbor had 5..one was a rooster until she got rid of it, then another one became the new rooster! Apparently there are “roosters in hiding” that will only start to crow when the alpha rooster is dethroned…or kicked out. I absolutely loved hearing him crow when I was in the backyard weeding. I live in the very throws of suburbia with nothing but city and standard cookie cutter life all around me so to hear a rooster crow throughout the day really made me feel like I was somewhere far out in the country…but not too far out that I can’t get to a Walmart in 5 minutes. I have no shame. The WORST PART is that my neighbor is moving. She gave her chickens to her brother because in her words, she knew if she offered them to me it would have caused a fight between me and my husband. She’s right. I would have kicked him out to make room for the new Rooster. I live in Rogers Park (North part of Chicago) and we have neighbors across the street with chickens. I have never once heard them, and despite being in the city it isn’t noisy all the time. I say go for it… give it a shot! i have had urban chickens a couple of times (sadly not currently) and they are a lot of fun, a lot of work and the most delicious eggs you will ever eat. Go for it. I’ve got a few friends who have chickens, they love them – they eat all the kitchen scraps (well most of them) and in return they get an abundance of beautiful eggs. I guess they come with the downsides of most pets, but also have benefits! This is so inspiring and makes me want to keep my own chickens! There’s a whole “chicken support group” of folks raising chickens here in Oak Park, organized through Unity Temple. I can put you in touch with the group if you like. I’m a long time reader of your blog and felt I really had to come out of the woodwork to answer this question. First of all, I’m Australian. I live in a town of about 25000 people. Though our block is quite large for suburban standards (1800 sq m), it is still a suburban block. We keep chickens and after some research decided the deep litter system would work for us. My husband, being a carpenter was able to build our chicken coop. The chickens stay inside all the time and are very happy to do so. The litter that is used on the ground is then used as mulch on our vegie garden. It needs to be changed over every four to six months. There is plenty of information out there on deep litter systems if you want to research it further. I know that our council regulations stipulate how many hens can be kept and where the chicken coop can be built. It has to be a certain distance from the main residence, neighboring houses and fence lines. I hope that was of some use to you. Finally I want to add that there is no better feeling than knowing you are eating something so fresh or something you have produced in your on backyard. We have chickens in a densely-populated area within the city limits of Columbus, OH, and love it. You may want to check out my FAQ here: http://kusine.com/blog/2010/04/22/faq-raising-chickens-in-columbus-oh/. we live in the country in a stone farmhouse built in 1845. It was a farm of course, so it came with it’s own blacksmith shop and a couple of chiken coops , plus all of the barns. The smaller coop is probably from the 1940’s and is the sweetes thing. The feeders were all built in, and the paned windows all have bubble glass. I knew when we moved here I would ultimately keep chickens. Finally when our daughter was old enough, we loaded up. It is amazingly fun and I have become totally obsessed. There was an Earth Day Fest in Oak Park last weekend that had an urban chicken consultant from Home to Roost. The consultant lives in Oak Park, so you might want to check them out. Oak Park does allow you to keep two hens (but no roosters.) The Animal Care League on Garfield in OP does chicken checkups, too. We’ve been looking into getting chickens, too, but we have a chain link fence and our next door neighbors have a german shepherd, so we aren’t sure how that would fare (constant barking and/or chicken heart attacks?. It is fun to look at chicken coops, though, and fresh eggs would be great! My neighbor just got two new dogs, and they’re sort of aggressive (barking and going mad trying to get us through the fence), so I worry about that too. The ACL is where we got Murray though! Nice to know that we can bring our (potential) chickens there too. Our neighbors keep about 5 chickens in a little coop in their yard. We live in a busy suburban neighborhood in Texas. I think their coop being so close to both our house violates city code but they asked us first and we don’t have a problem with it. Once my veggie garden is up and producing this summer I’m looking forward to bartering for eggs. I like listening to their little chicken sounds through the fence in the evening. Makes me want to keep a chicken just to have one of those lovely coops to look at in my yard! 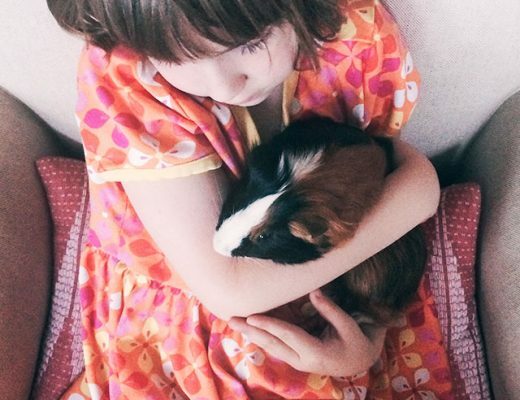 we are looking into getting chickies + coop for my daughter who wants to do 4-h this year. and honestly, for me too because i like to do a lot of baking and i’ve been buying organic eggs (and they are expensive). our neighbors had chickens and i loved hearing them cluck during the day :) we live on the outskirts of town and have to design the coop to fend off predators (coyotes and weasels and the like) AND chickens are messy (my husband volunteered to clean it thank goodness) but we are excited. and love the chicken coops that you posted, especially no. 3. I really like #4 and #6. I guess it would depend on how many you have. My father had chickens and he says it was a real benefit! We just finished helping our friends build a chicken coop for their backyard in Bridgeport! They’re now mom and dad to three chickens, which they got at only one day old. The coop is contained under their back deck, which is convenient. We’re actually in your neck of the woods, so we’re unsure how our neighbors would feel about chickens, but we hope to reap the benefits of our good friends’ new hens. We had turkeys growing up and they were a PIA – the foxes always ate at least half of them before “harvesting” time. I’d love an Omlet(?) coop for chickens, but we travel too much so I think we’d end up regretting the decision. A girlfriend of mine in Maine has a coop with a ton of chickens and they eat fresh eggs daily. They really are the best eggs ever! The only problem is that when you order your chicks you can’t tell if you’ve got a rooster, so you kinda have to be ready to well, um, ya know, the whole neck thing…. I am surprised that rising chicken is a hit n US. In Asia / Hong Kong where I live, we have chicken as pet / source of eggs / even meat for many years. Recently there is a ban of having chicken at home due to bird flu. I think US weather is colder and dryer which is less favorable for the gems to grow. Just remember to wash hands and the eggs before consume. 2-3 hens are VERY easy. Don’t listen to the naysayers since you won’t be getting a rooster. I grew up with chickens and most of the negatives are caused by the boys (oh, big surprise, right?). They crow, they attack people, they fight, they make the girls squawk when they decide its mating/attack time, which is about every 15 minutes. I also live in the South where heaters for grown hens and water heaters are unnecessary. Chickens DO fly (about 20 ft. intervals), and they love to perch on fences, but they don’t go away because they know their food source! Hens alone will only squawk when laying an egg (maybe once a day), and they mildly cluck walking around… nothing an urban setting couldn’t handle. My neighbors have 2 or 3 chickens and they have a TON of eggs. More than they can eat. We live in a very urban neighborhood with houses (actually the most diverse zip code in the US: 98118) and they do fine in a small backyard. They aren’t that loud either! I live in a suburban neighborhood and someone definitely had a rooster for awhile. It was annoying as heck, particularly when it wakes you up at 5 am on the weekends. I haven’t heard it in awhile, so maybe someone else found it and took care of it! Unless you live in the country, I just think it’s rude to have a rooster waking your neighbors, so as long as you don’t get one then sure. Just be careful with the baby around them. Chickens aren’t friendly little pets, they’ll scratch the bejesus out of you. Personally, I don’t like brown eggs. My aunt has a farm and they use their own chickens’ eggs and I don’t enjoy the flavor. I totally agree with Lauren up there…We live in Florida and have raised two hens in our backyard. I get two eggs a day (more than I ever need) and they are practically nothing to take care of. I think our neighbors found it odd at first, but now they are always talking to us about it. I fully promote it! Personally our chicken are fairly friendly. They allow us to hold them often and rarely peck or scratch us. We also have a dog that doesn’t bother them as well. Hope this helps! My downstairs neighbors had two chickens until very recently. We’re in a position that is a cross between urban and suburban. There is a garden, but it is small. The chickens were in a small enclosure with a wooden nesting house inside. They were allowed to roam in the garden each day. They’d deliver two eggs a day for their breakfast. A neighbor (apartments all around) complained about their noise (Which was minimal unless they got scared) and the council rejected their complaint. They became very tame. Would hop up on peoples laps. They’d also scratch into the garden and damage plants etc, unless they were protected appropriately. unfortunately they were both killed recently, beheaded, overnight, and when in their coop, by what we think was a suburban fox — or an incredibly strong and aggressive cat. I was living in Chicago last year, in the Portage Park neighborhood, and our neighbor was keeping chickens. It surprised the heck out of me the first time I saw them, but I love the idea. Once we own a house, a garden and some chickens will definitely be on my backyard list. I rent in San Francisco and have 2 hens. They both lay an egg a day and are an excellent addition to my garden. I build furniture and chicken coops at a shop in Oakland, CA. If you are in the Bay Area come check me out at Maker Faire in San Mateo May 22&23–Just Fine Design Build. Thanks and keep it chicky. The only thing I have to add being a former country girl who grew up with chickens is to take into consideration predators, which I will confess I have no idea about in the city/suburbs. ;) Where we live is just city enough not to have to worry about larger predators (coyotes, etc) but country enough that without the larger predators, the “smaller” ones (opossum, raccoons, etc) get much bigger than their more rural counterparts (probably because of a steady diet of pet food). Also, aside from the predators, the feed and eggs might also attract more “critters” such as rodents and snakes. We’re semi rural so we don’t count (we live on an acre, plenty of room for chickens and many of our neighbors have them). So did Stephanie: http://blueyonderranch.com/ though I can’t find the posts on her new blog. http://www.foodforeveryone.org has free chicken coop plans.